Thoughts so far: Love it for defense as it introduces more dynamics to layout designs, but still dislike it was at the cost of the Shocker. So far in offense it's about as useful as my worms are. Working on a video where you get to see it all in action and judge for yourselves, so subscribe to my youtube channel if you wanna see that. This also happens with the Scanner, which has no extra abilities in the brute force phase. Similar to the Scanner, the Squid also allows more connections than it has program slots. Maybe the Squid could be 3 programs / 4 connections too? Between Scanner and Squid, Scanner is still more reliable, since it is active on all nodes within 3 connections, instead of luck-based heavy sensitivity from Squid's. So even tho Scanner's sensitivity is far lower, its effect cannot be dodged at all. I would say even at higher levels, Squid's heavy sensitivity cannot be utilized effectively, since you can just wait until it's done scanning a node you want to hack (and that 3 secs waiting only increase 60 points of detection). This makes the Squid not as promising and relies on attacker's misclick or weak micromanagement, instead of constant active security node. The ability to dodge Squid's scanning completely makes the scaling on higher levels impractical instead of maintaining balance between stealth program's detection and Scanner's sensitivity like when you have upgraded Scanner. With Scanner, upgrading it promise the owner to be on-par with attacking player's upgraded stealth programs. With Squid, upgrading it just increase its sensitivity, which all of it can be evaded easily. 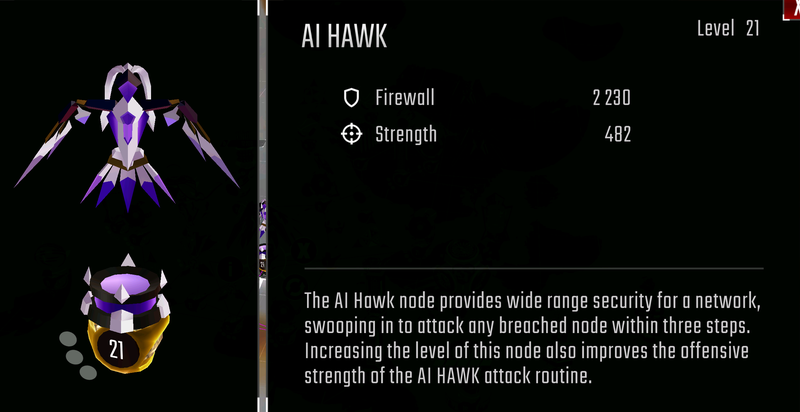 With 10 levels increment, at lv 11, the node/program will spawn 2 Hawks, but both Hawk can't attack same target and each have its DPS cut down to 3/5 from lv10. At lv21, the node/program will spawn 3 Hawks, 3/5 DPS from lv20. This is just to cause more chaotic replays tho. If the goal is to make them as simplistic with less to no gimmicks as possible, then nvm..
HCX - DReaD wrote: This is just to cause more chaotic replays tho. If the goal is to make them as simplistic with less to no gimmicks as possible, then nvm..
Yeah, that's how Hackers as a whole was designed, so most, if not all of your suggestions actually wouldn't fit in the game as well as you thought.